For UK primary schools, Chembakolli is probably the most famous village in India and December 08 sees the start of celebrations to mark 20 years of village life. 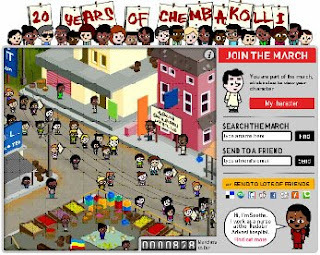 26 September 2008: Chembakolli, a village in southern India, was reclaimed following an unprecedented march in December 1988 by 10,000 Adivasi (indigenous people) from the Nilgiri Hills. Coming together to reclaim their tribal rights to live in the forests near the town of Gudalur, the march was a huge success, winning the respect of the government and local people. The Adivasi were able to settle in many villages on the land, including Chembakolli, as well as establish their own school and hospital. To celebrate this anniversary, ActionAid is launching an online march, enabling teachers and pupils to create their own character and personalised placard before joining the virtual march. Starting in Gudalur, the virtual route follows the footsteps of the real march, twenty years ago. In the town, the marchers can click on local landmarks, including market stalls, the hospital and school, and meet real life people and read their stories. As more people join the march, the route will extend into Chembakolli where visitors can learn about life in the village by clicking on parts of the village, local people, and an elephant. As part of the celebrations, ActionAid has also produced The Chembakolli story, a beautifully narrated audio CD accompanied by a story/activity book and poster. The CD covers the events of the past 20 years in six parts, each with descriptive sound and music clips recorded in the village. It is ideal for classroom listening and interpretive learning and is available for £20 (inc p&p).